Fifteen years ago, at the age of 13, Kirsty James was told she would go completely blind. From then on, every morning as she brushed her teeth she wondered if it would be the last time she’d see her face in the mirror. As she struggled to come to terms with her diagnosis she started seeing visions – which left her terrified that she wasn’t only losing her sight, she was also losing her mind. It was the first week back at school after the summer holidays and 12-year-old Kirsty James was in registration. The teacher told the children to copy down from the board the new timetable for the term ahead. Kirsty didn’t yet know there was anything seriously wrong with her eyes. She knew it was hard to see the whiteboard at school, but hadn’t fully admitted it. She would deliberately try to get kicked out of lessons for bad behaviour to avoid having to read in front of the class. She didn’t talk about her deteriorating eyesight with anyone and nobody suspected, until one day she walked past her mum in the street without seeing her. Numerous trips to the opticians followed, but they couldn’t find anything wrong with Kirsty’s eyes. She was just pretending she couldn’t see because she wanted glasses, they said. So when she was eventually referred to hospital, diagnosed with a degenerative eye condition called Stargardt disease and told that she would go completely blind, Kirsty was floored. In its early stages Stargardt disease can be very hard to detect, which may explain why the opticians had failed to spot it. 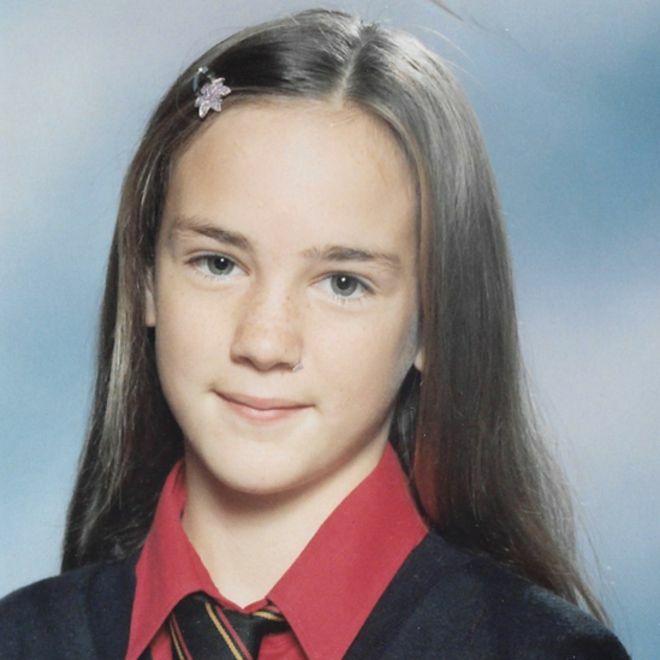 Provided with little information about the disease or what was going to happen, Kirsty and her parents were sent home to do their own research. Her mum and dad encouraged her to continue to carry on as normal, and for a time she got by – at this stage she didn’t need a cane and coped at school by sitting closer to the front. “I was still being Kirsty, but inside I was really scared and I couldn’t express myself,” she says. 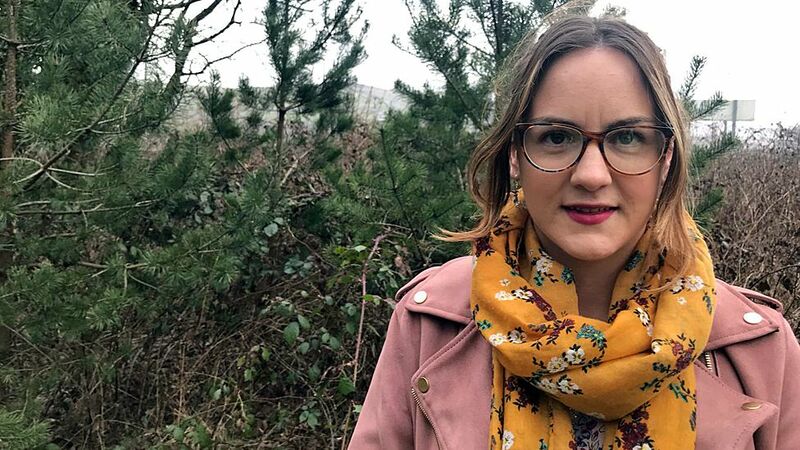 Kirsty went on to university and although a few of her tutors knew about her eye disease she refused any extra support – something she now acknowledges had a negative effect on her education – and tried to conceal her loss of sight from the other students and her friends. “I just wanted to be normal, to be like everybody else, and I thought that by not telling anybody it would go away,” she says. There was one place where Kirsty did feel normal, and that was when she was out dancing. And it was while out clubbing in 2011 that Kirsty met Tom. Over time their relationship developed and Kirsty realised that she’d fallen in love with him. 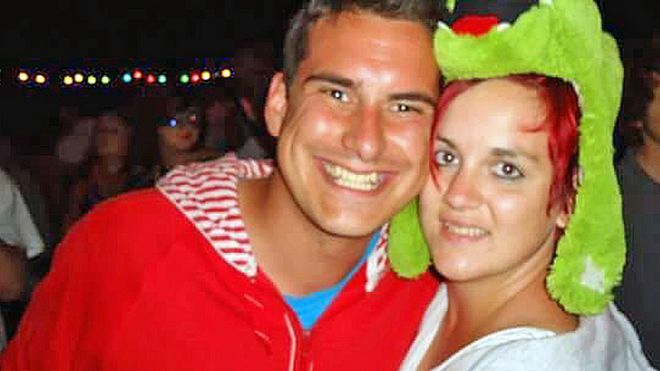 She decided she was going to tell him at a music festival he was DJ-ing at, by suddenly revealing a T-shirt made with the words “I love you Tommy T” printed on it. “But I hadn’t given my sight loss any thought – I was still in that denial head-space,” Kirsty says. Kirsty was really upset that she’d missed out on such a special moment with Tom, but other things were happening that were causing her greater concern. “I’d go food shopping and I’d buy everything that was on my list, but when I’d get home and open the packaging it would be something completely different,” she says. “I thought I was going mad. When Kirsty moved house things became even worse. “The new place was quite dark and I used to think there were people in my flat – I’d see them, I’d see figures,” she says. There would be cars outside Kirsty’s flat – on a cobbled street much too narrow for any traffic to drive down, or a leg of lamb sitting where she’d put down her cardigan. Kirsty was living on her own, far away from her family, and although Tom and her close friends knew about her loss of sight she didn’t confide in them about the strange things that she was seeing. These visions, combined with deteriorating eyesight, were making Kirsty increasingly fearful about going out. She’d mistake lorries for buses, be afraid that she was going to fall down steps that weren’t there, and feel stranded when the gravel in front of her would suddenly appear to be a river in full flow. Then, within months, Kirsty woke one morning to an unpleasant surprise that she had lived in dread of. “I remember it as clear as day,” she says. Overnight Kirsty had lost a very significant amount of her sight and could no longer do most of the things she had previously managed to do. “All of a sudden I couldn’t even leave the house, I just felt so isolated,” she says. And the drastic change in her vision further increased her anxiety levels. She even asked Tom if he wanted to end their relationship. Tom assured Kirsty that he didn’t want to leave. In fact, he said, he wanted to marry her. 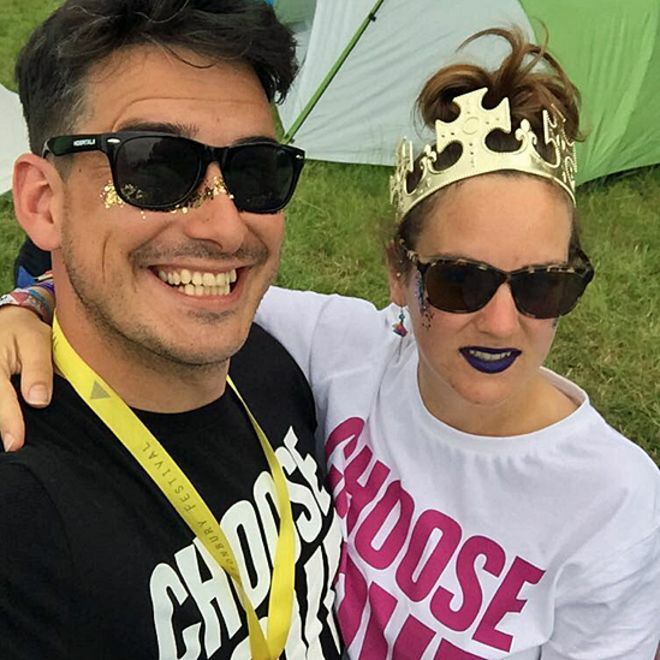 He gave up his job and became Kirsty’s carer, helping her to relearn how to do everyday tasks like making a cup of tea and doing her hair and make-up. “He’ll go over my foundation and make sure it’s properly blended and that I’ve not missed any of my eyeshadow,” Kirsty says. “And he paints my nails and he’s a dab hand at hair products. Eventually Kirsty realised that she had to deal with the impact that Stargardt disease was having on her life. She went on anti-depressants, something she’d always insisted she didn’t need, and she started talking about her sight loss and accepting support. But she didn’t tell anyone about the strange visions she’d have from time to time and they’d never gone away. 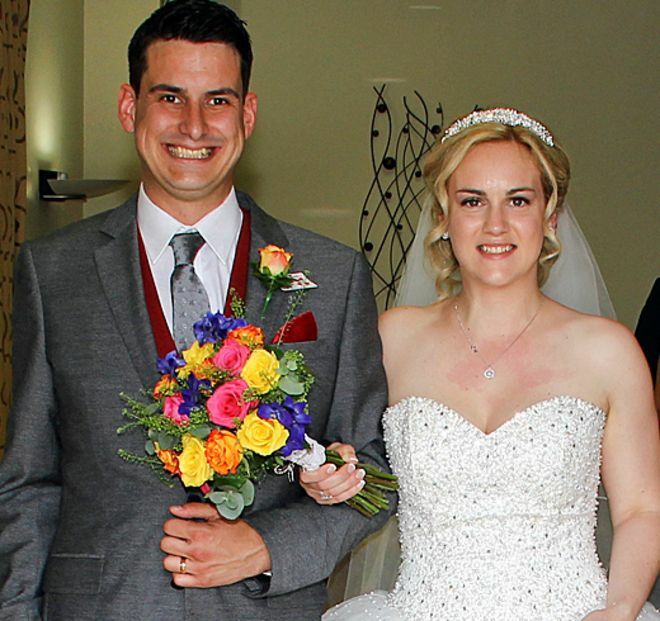 Kirsty and Tom got married in June 2015. Kirsty had made Tom promise that he wouldn’t turn around as she walked down the aisle with her new guide dog, Bass – who was carrying the couple’s rings in a little pocket attached to his collar. “I didn’t want to miss our moment again, so I told him not to turn around until I was just a couple of feet away,” Kirsty says. Kirsty’s unexplained visions continued until a routine appointment with a low-vision specialist to be measured for a new magnifier – a device to help her read text on her mobile phone. However, Kirsty surprised herself – she found she could easily read the text in the small font. But she’d not read the text in front of her at all, she had hallucinated and read out something completely different. 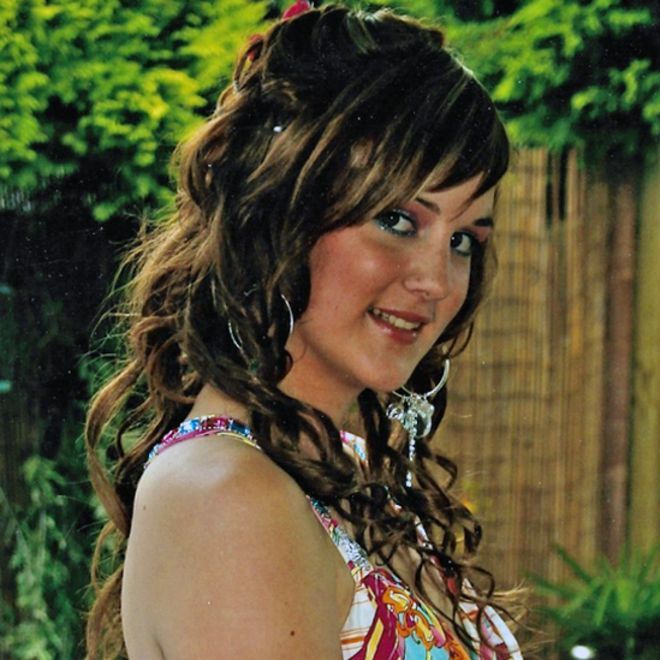 The optician asked Kirsty if she had ever heard of Charles Bonnet Syndrome – and she said she hadn’t. He explained that it affects people who are losing their sight and causes the brain to replace images with hallucinations because it’s trying to make sense of what it is seeing. Even though Kirsty knows that the hallucinations she experiences have nothing to do with her mental health they continue to affect her everyday life. And sometimes the hallucinations can be really distressing – like one which caught Kirsty off-guard on a rainy winter’s day last year. “I was at Slimming World queuing up to be weighed – I don’t normally talk to anybody there,” she says. The woman next in line asked Kirsty if she was OK and reassured her that there was nothing on the floor, except for a puddle of water where people, dripping from the rain outside, had been standing. Embarrassed, Kirsty apologised and explained that she has an eye condition that makes her hallucinate. Knowing that she has CBS means that Kirsty has been able to develop coping strategies for dealing with the hallucinations. 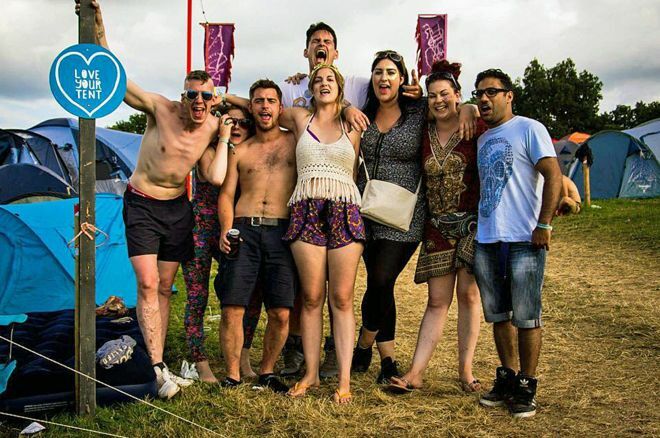 Reaching an acceptance of her sight loss and finding an explanation for her hallucinations were important steps for Kirsty – and made her realise that she wanted to help people in similar situations. 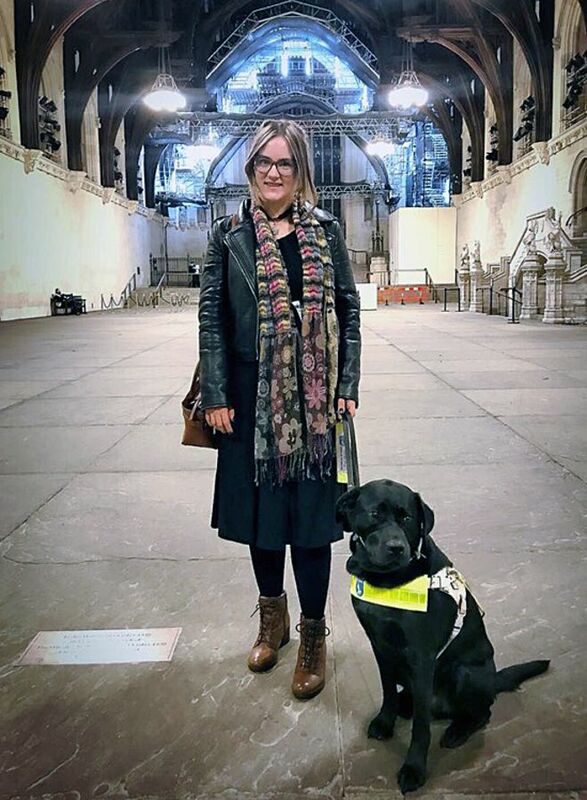 She found a place on a Royal National Institute of Blind People (RNIB) trainee scheme and became a digital skills officer, visiting visually impaired people in their homes to help them get online and talking to them about their sight loss and CBS. “I don’t want people to feel like I did – so lost and angry and depressed,” she says. Last summer, Kirsty’s consultant ophthalmologist told her that after three years of monitoring with no change he’s confident that her sight loss has now stabilised and shouldn’t get any worse. “My sight has a fuzziness to it like watching an old analogue TV that isn’t properly tuned in,” Kirsty says. “I’m centrally blind so I can only see bits through the sides of my peripheral vision and although I can see the shapes of things I don’t see any detail and I struggle with some colours. Kirsty is grateful for the sight she has been left with and thankful that she can still see the shapes of the mountains where she lives in Caerphilly in Wales. “For so many years I would wake up every day wondering if I was going to be blind,” she says. All photographs courtesy of Kirsty James, unless otherwise stated. This entry was posted in England, Europe, Health, History, World and tagged Charles Bonnet Syndrome, eyesight, Health by rolyred. Bookmark the permalink.